Supreme Floors, the flooring arm of CeyaCon specialises in premium quality, modern and inventive flooring. Located in the heart of Colombo city they received high commendations earlier this year as they floored the Architect 2018 Exhibition organised by the Sri Lanka Institute of Architects, with their excellent range of specialised flooring products, customised services, and a uniquely designed interactive exhibit. The recent Supreme Floors exhibit at the Architect 2018 resulted in arousing great public interest. 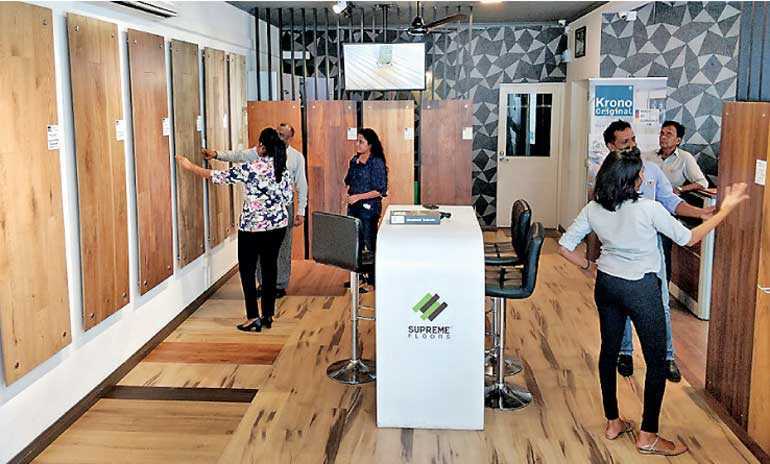 Featuring a real-life visual walk-through experience, customers were able to personally visualise the best suitable products for their requirements after sampling out the flooring available on display. Within a short span of five years Supreme Floors has already established their roots and created a recognisable and reputed brand by cultivating age-old techniques into modern designs. Their carefully selected portfolio comprises an extensive reach including both indoor flooring and outdoor decking. They have partnered with internationally acclaimed brands for distributing in Sri Lanka and the Maldives, representing companies like Krono-Original Laminate Flooring from Germany, Ultrashield-Naturale Composite Outdoor Decking by NewTechWood USA and other international brands. For aesthetically pleasing and elegant floors, Supreme Floors introduced the Krono-Original (Germany) wooden laminate floor made from only the best materials, with a natural appearance and feel. Being the world’s leading manufacturer of laminate flooring, they have established a well-recognised reputation around 90 countries over the world including Sri Lanka. Be it classical or modern, Krono-Original laminate floors offer the look and feel of real wood with varying options and features to turn the simplest of rooms into a cosy and exclusive space. Supreme Floors carefully selects their products to go in line with their promise of distinctive designs and high quality.For outdoor decking, solid wood stands as a popular choice among many people, for its natural look, but maintaining that beautiful façade especially in our sultry climate can be quite challenging. Newtechwood (USA) Ultrashield Naturale Composite decking system supplied and installed by Supreme Floors solves this problem. Ultrashield Naturale decking planks made out of a composite substitute (including wood fibres) lasts over a longer period, requires less maintenance, whilst creating the natural look of wood and realistic texture without all the added work. “We have gained significant insight and experience working with homeowners, offices, hotels, restaurants and many distinguished architects and contractors. Further expanding our horizons we have worked in large-scale commercial, residential and government projects. We have supplied our flooring products and were involved in some notable projects in Sri Lanka, the likes of Anantara Peace Haven by Hemas Leisure, 7th Sense by John Keels and even supplied internationally to the Club Robinson Resort in the Maldives. We are also honoured to count industry leaders like Sanken Constructions as our esteemed customers,” Saldiwala the Director added further. Supreme Floors strives to ensure ultimate customer satisfaction, paving the way for an affordable, luxurious and stylish living. A floor is a lifetime investment and gives the end-user the confidence to stand tall. 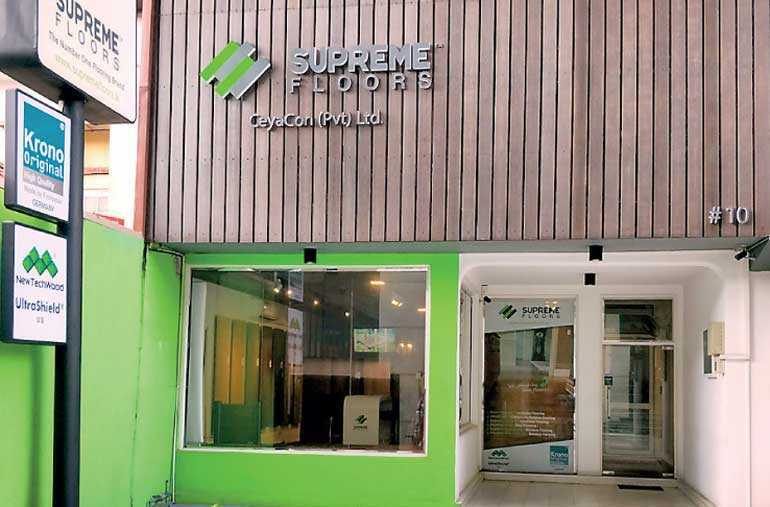 For more information on Supreme Floor’s products and Services, one could call their hotline 0777877363 or visit their website at www.supremefloors.lk and the showroom at #10 School Lane, Colombo 03, Sri Lanka.